The situation in Israel today is one of agonizing fear and pain. Random horrific acts of terror – many with deadly results – are taking place throughout Jerusalem and all around the country with increasing frequency and brutality. No place is safe. Chabad’s Terror Victims Project (CTVP) has ramped up our services dramatically to meet the urgent needs of the many victims and their families. We are literally going from hospital to hospital, home to home, 24 hours a day, to bring comfort and hope to those whose lives have been shattered in this newest wave of violence. 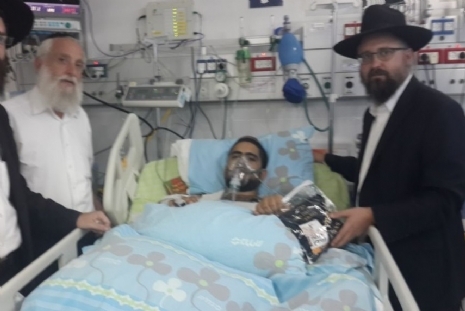 On Tuesday, Elyosef Malkeli, a wounded IDF soldier who went on the CTVP trip to Miami, came with us to the hospitals. He was able to share his own story from a year ago with the families whose loved ones are fighting for their lives in intensive care units and operating rooms. His calm demeanor, the fact that he is now fully healed, brought the families strength and hope in a way that was critically important for them. The pain and horror that we are seeing is awful. Each day is bringing new violence. CTVP is everywhere, with staff and volunteers giving of their time continually, without letup so that no family is facing the fear and agony of this horror alone. We are providing everything we can for them from immediate financial assistance to comfort and counseling, as well as practical assistance – babysitting for children at home, hot meals, rides to hospitals, and more. We are asking everyone to please pray for the safety of Israel and her people at this urgent time and please make a donation to CTVP now to enable us to carry out our life-sustaining work without interruption. Thank you. CTVP Providing Comfort and Solace to Victims of the Recent Terror Attacks.